Nathan Chinenye Okechukwu Kanu, the last of three children, was born on March 7th 1966 to Mr. Emmanuel Izuzuoha Kanu and Ezinne Rachael Onunwa Kanu (nee Chigbu) of Arugwa Obegu in Ugwunagbo Local Government Area of Abia state. He graduated from Community Primary School Obegu (St. Peter’s School) in 1978. He attended Mgboko Umuanunu Secondary School, and Secondary Technical School Obegu. At the age of ten, he joined the 5th Obioma Ngwa Company of the Boys’ and Girls’ Brigade under St. Peter’s Anglican Church Obegu. The same year he joined St. Peter’s Anglican Church Choir. In 1980, Nathan took up the responsibility of a Catechismal class teacher at St. Peter’s Anglican Church Obegu, and two years later, he was appointed the Church Choir master, a position he hold till 1989. In 1984, he became one of the first Anglican Youth Fellowship Leaders trained at Bishop John’s Church Center Nbawsi. Now in Isiala Ngwa Diocese. Before going into full time ministry, Nathan worked for Bendel Insurance Company, Niger Garment Factory, Seven Up Bottling Company, and as a vocational School teacher. His full time ministry began at St. James Anglican Church, Umuamoke in Abayi Nchokoro Parish of Aba Diocese, as a local helper. He moved on to St. Mary’s Anglican Church Amaiyi Nvosi, in Nvosi Parish of the Present Isiala Ngwa Diocese, as a Catechist. It was from St. Mary’s that he was selected by the Diocesan Bishop of Aba, Rt. Rev’d Prof. A.O. Iwuagwu (Rtd), for Theological Education. He graduated from Trinity (Union) Theological College, Umuahia 1994, and was made a Deacon. He was priested the next year. 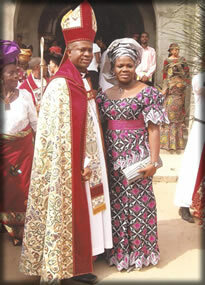 He served his Diaconate at St. Philip’s Anglican Church, Eziukwu Aba. After his Priesthood ordination and wedding, he was moved to St. George’s Anglican Parish Aro-Amano as the Parish Priest. In January 1996, Nathan and his wife were moved to All Saints’ Anglican Church, Abayi Umuocham. It was at All Saints’ Church Abayi Umuocham that they had their first child, and from there also, the Lord relocated them to the United States of America the same year. In the United States, Nathan served as a Priest in the Episcopal Diocese of Oklahoma under Bishop Robert Moody. He served as a Supply Priest to Church of the Resurrection Oklahoma City, St. Christopher’s Church Midwest City, Holy family Church Langston Oklahoma, and Church of the Redeemer Oklahoma City. He also served as an assisting Priest at Church of the Redeemer Oklahoma City. He also served as assisting Priest at Church of the Saviour Yukon, Oklahoma. He was a member of the Oklahoma City Faith – to – Government initiative. In October 2003, the Church of Nigeria (Anglican Communion) officially broke communion with the Episcopal Church USA (ECUSA) for taking actions that compromise the faith once delivered to the Saints. In obedience to the Lord Jesus Christ, and in solidarity with the Church of Nigeria (Anglican Communion), Rev’d Kanu formally left the Episcopal Church, and in January 2004, he founded Christ Ambassador’s Anglican Church in Oklahoma City. In 2005, the Primate of Nigeria, His Grace, the Most Rev’d Dr. P.J. Akinola announced the formation of the Convocation of Anglicans in North America CANA (A mission of the Church of Nigeria Anglican Communion) with the Primary purpose of caring for the spiritual life of Nigeria immigrants in the United States. In a retreat in Houston, Texas same year, the Primate of Nigeria appointed Rev’d Kanu as the Communications officer of the Convocation. With this appointments, Nathan became the first officer of the new mission. He also served as a member of the Reception Committee, which reviews applications for new members, and was the Chief liaison between CANA and the Church of Nigeria (Anglican Communion). He also was an ex-officio of the founding board of trustees of CANA. On April 2nd 2006, in a divine service in Los Angeles California, Rev’d Kanu was preferred a Canon of the Cathedral Church of Avert Abuja, by the Primate of all Nigeria, and the Bishop of Abuja Diocese, His Grace, the Most Rev’d Dr. Peter Jasper Akinola. In a meeting of the Episcopal Synod of Church of Nigeria (Anglican Communion) held on September 12th 2007, Nathan was elected a Bishop of the Church and to serve as a Suffragan Bishop of CANA. Bishop Kanu, in addition to serving as a CANA Bishop continued to serve as the Vicar of Christ’s Ambassadors’ Anglican Church Oklahoma City. On March 14th 2009, in a meeting of the Episcopal Synod of the Church of Nigeria (Anglican Communion), Bishop Kanu was unanimously translated to the See of the Diocese of Aba Ngwa North, as her second Bishop. Rt. Rev’d Nathan C.O. Kanu holds Diploma in Theology, Diploma in Religious Studies, Bachelor of Arts, Master of Ministry and a Ph.D in Psychology and pastoral Counseling. Since his enthronement as the Bishop of Diocese of Aba Ngwa North, Rt. Rev’d Nathan C.O. Kanu has received awards by both Christian Association and international organization just to mention but few. In 12th December 2009 the Christian Association of Nigeria (CAN) Osisioma Ngwa chapter of the Association appointed him the LIVE PATRON. He provided a space in the Diocese for the Association to hold their regular Meetings/prayers until recently when the local Government Authority gave the Association an Office accommodation. In January 2010, the Potters House Historical Center Nigeria PHHC West Africa presented an Award of Excellence for A DISTINCTIVE ECCLESIASTICAL DOYEN on Rt. Revd Nathan C.O. Kanu in acknowledgement of his outstanding Dedication, sacrificial and Ecclesiastical Services in South Eastern region of Nigeria. The Bible Society of Nigeria selected Rt. Revd Nathan C.O. Kanu for an Honourable Award of AMBASSADOR OF CHRIST on 9th October 2010. The Boys Brigade Nigeria of Osisioma Ngwa Battalion Council presented an Award to Bishop Kanu for his meritorious and excellent service to the Brigade. Peace International, Regional Council Office (South-South and South Eastern State) Owerri gave AMBASSADOR OF PEACE Amb.P award to the Bishop in recognition of his patriotic and selfless service to humanity, epitome of brotherhood, advocate of social justice and rule of law, Defender of the oppressed and champion of Peace. International Association of Lions Clubs District 404A Nigeria, Aba Metropolitan Lion Club presented an Award of Excellent Service to Rt. Revd Nathan C.O. Kanu in the Area of Christian Faith Development on 13th Day of November 2012. In fulfillment of the Biblical calling Rt. Revd Nathan C.O. Kanu ascended to Jerusalem, the Holy City Capital Israel in 2008 and authorized to bear the title of Jerusalem pilgrim JP. Bishop Kanu is married to Princess Odionyenfe N.C. Kanu, who he refers to as a Favour from the Lord. Mrs. Kanu (JP) holds a bachelors degree in Business Administration. They are blessed with four children, Oluebube, Chiadiemela, Chideha, and Akuchinyere. The entire family is grateful to God for calling them to His service and looks forward to serving Him, and His Church.